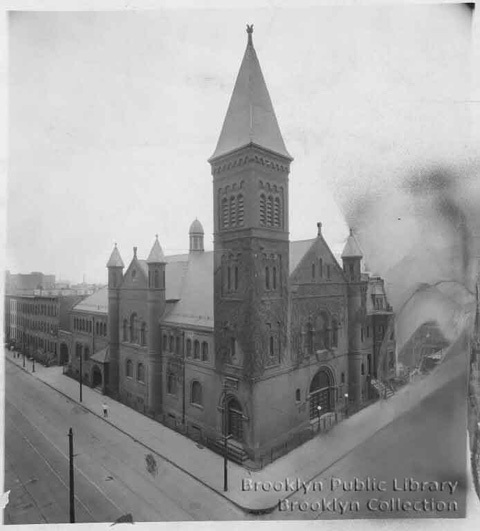 Last week, the Landmarks Preservation Commission held one of its designation hearing days. The day included public hearings for two Coney Island landmarks, the Shore Theatre and Childs Restaurant. The Commission calendared St. Paul’s Evangelical Lutheran Church for a future public hearing, the first step in the designation process*. LPC also took the final step and designated four new landmarks last week [pdf], including the former Germania Fire Insurance Company on the Bowery. The Lower East Side and East Village was once home to Kleindeutschland, the largest largest German immigrant neighborhood in greater New York City. The second-largest German immigrant neighborhood was, of course, Williamsburg and Bushwick. *Disclosure: I did the initial research on the history of the church and worked with the congregation to get funding for a condition survey and restoration work.